Hey guys, by now, a lot of Clash Royale players have obtained the Bandit. Bandit is the new Legendary card which has the outstanding ability, making her invulnerable to everything. In this guide, I will try the best to help you understand how to use the Bandit and how to incorporate her into your decks. Hey everyone, Exordium here! As you probably know, I’m a YouTuber, so I’ve written this enormous in-depth guide on the Bandit – please support me here! The Bandit is one of the newest Cards that has just been released into Clash Royale, in the March 24th major update. As well as other features such as Clan/Team Battles, the Bandit is an exciting new Legendary troop that offers new unseen before abilities. 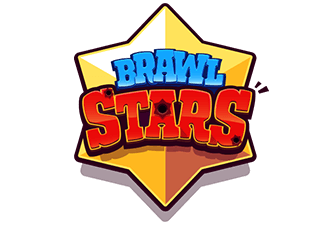 This extensive guide, which can be navigated using contents below, will analyze every little feature of the Bandit, and I can assure you after reading this guide it will be as if you have been using the Bandit for weeks. The Bandit is unlocked from Arena 9 (Jungle Arena). She is a troop that has the ability to dash to nearby targets, dealing double damage if she hits a target with her ‘dash’ – similar to a Prince or Dark Prince’s charge mechanic. The Bandit is invulnerable while dashing straight towards the intended target. This means she can’t be hit by anything during the dash, including splash damage, knockback effect etc. She will do the dash immediately If there is any troop in her dash range (4-6 tiles). This means If a troop is within 3 tiles, the Bandit will talk to it. If a troop is outside 7 tiles, she will not get distracted, she will start charging once it gets within 6 tiles. At Tournament Standard, her dash deals 320 damage. You should remember this in case you want to finish off the Tower with her. 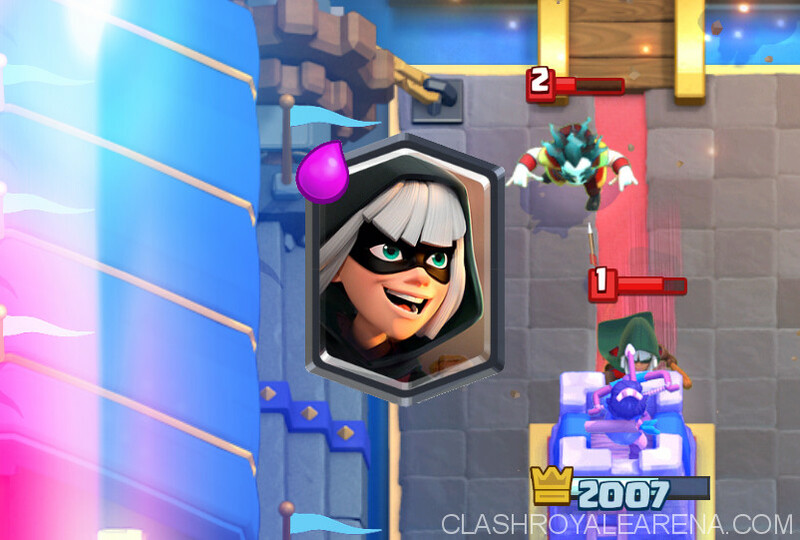 Similar to the other charges, you can reset Bandit’s charge with Freeze, Zap, Lightning, Electro Wizard, Ice Spirit etc as long as you can touch her before she actually dashes. Also, her Target isn’t determined until she actually dashes the target. She always dash onto the closest troop. For example: Assuming she is already locked on your Tower. While she is charging up the Tower, you can place the Skeletons down, forcing her to dash Skeletons instead. 12/6/17, increased the Bandit’s hitpoints by 4%, and initiated her dash ability quicker. 12/2/18, decreased her minimum dash range to 3.5 (from 4). The Bandit can effectively charge, a mechanic that you are all probably familiar with from the Prince themed Cards in the game. Your main aim, however, when using the Bandit is very different to other Cards. Or as a chip Card (its dash can deal huge amounts of damage but is often ignored, and it is a mere 3 Elixir)! Ignoring her can result in over 1,000 damage at Tourney standards to your Tower! The Bandit is very useful when trying to clear the area for a heavy, slow tank such as the Giant. Because of the dash mechanic, it can zigzag across sections of the battelfield in no time at all, devastating defensive setups, even when troops such as the Mini Pekka are used. Assuming a reversed offensive setup, with the Bandit in front of the tank unit, can be very efficient in some situations. If your enemy has dropped any glass cannons such as the ones named above, preceding the Giant or your tank of choice with the Bandit (far enough back so that the invisibility mechanic can occur before it is locked onto) can be a wise move. The Bandit can fit well into pretty much ANY Deck archetype, making her a unique and incredibly versatile troop! Maybe you don’t know, she can dash across the river. So If your opponent places Furnace or Tombstone at the middle, you can use her to take them down. Your Bandit has a blue tail when she dashes, while the enemy’s Bandit has a red tail. If you place the Bandit at the pig push spot, she will dash straight to the Tower instead of target the building on the opposite half of the Arena. So, we have established that the Bandit is a pretty versatile Card – now let’s break it down. The Bandit has several unique features that will set it apart from others: a ‘dash’ ability, cloak of invisibility after charging up, and double damage after a charge. Because of the conditional advantages the Bandit can offer, there are HUGE differences between beginner and master players of this Card. Dash – This ability is fairly simple on a primary level, but most of the Bandit’s abilities merge together or affect each other, making it altogether a complex Card. This move allows the Bandit, after 1 second (AFTER SELECTING A TARGET), to ‘charge’ and deal double damage on impact. This ‘dash’ actually grants invisibility, which is explored below. This charge is unlike a Prince or Dark Prince – it cannot be stopped via a direct Zap onto the unit, but CAN be retargeted by your enemy if a distraction is placed in front. Surprisingly, the Bandit can dash through the pushback effects of the Log and Bowler, and therefore the inbuilt charge reset mechanisms for these troops are deemed useless. As a result, any bait or control opponents are good matchups for Bandit users, because it directly counters their advantages. (Read below for more detailed guides taking on every meta and archetype Deck out there!) ‘Dash’ works best against spaced out troops, so be sure to exploit this – it can completely mitigate the effects of some otherwise lethal defensive units! Double Damage Dash – This is the resultant effect of the ‘dash’ that the Bandit is able to perform. You are probably familiar with similar effects from the Prince, Dark Prince and Battle Ram. She will inflict double her normal damage (320 at level 1) to the target that she has locked onto, or can switch to a new target if it happens to be deployed closer to her. Unlike the Battle Ram the Bandit has no set target and can therefore be lured easily, but lures are actually very GOOD for the Bandit, due to her superior speed. Invisibility – Also an immensely powerful feature of the Bandit. This enables the Bandit to actually remain unseen, at least until something begins targeting it. Unless the Bandit ‘bug’ or glitch occurs, when the Bandit charges after being targeted by troops or buildings they will still be able to attack it, but any other units will not. Think of it simply; if a troop has ‘seen’ the Bandit, they will continue to see it, and vice versa! The way to utilise this ability to it’s highest potential is to learn about placement. If you place the Bandit close to another unit, despite Bandit being a melee Card, it will be a waste. Defend using the Bandit by placing it behind a Tower or while troops approach, between your two Towers. This allows the Bandit access to the 4 tiles it needs to charge and execute its dash ability, and consequently turn invisible. If you place the Bandit behind a tank, you are even more likely to be able to ‘hide’ the Bandit. Remember, when the dash ends it is revealed to enemies, and once an enemy locks onto the Bandit, it cannot escape. When using the Bandit, although she has medium health, viewing her or treating her as a low health ‘glass cannon’ type unit could be very beneficial. This will allow you to exploit your enemy, as Bandit is vulnerable to things such as the Mini Pekka and even cheaper choices such as the 1 Elixir Skeletons. Interrupting her charge is what an experienced enemy will do, so expect this; hence why synergies like HogLog or Giant + Wizard work well with her! Because of the Bandit’s fast speed, she pairs off best with slower Cards such as the Giant. Miner + Bandit blitz cycles can also be very powerful – when Deck building, make sure you have at least one other solid support unit like the Musketeer, and a good tank/mini tank such as the Ice Golem or Knight. I would not use the Bandit as a solo starter troop, to begin a game. Unlike the Miner, Goblin Barrel, Dart Goblin and other good 3 Elixir starter units, Bandit doesn’t have the same ‘shock’ or surprise tactic before charging, and is therefore an easy way for your enemy to make a positive Elixir trade using Skellies or Goblins. Instead, stick to the normal rotation of your Deck and follow your regular cycle, employing the use of the Bandit as a secondary support Card for cheap pushes. There will be more in-depth strategic advice in the sections to follow. So, Decks, An important part of this guide! So, being able to take on meta Decks with the Bandit is important. Because this guide does not focus on one singular Deck to play, I will he be giving summaries on the Decks above and how to use each of them. Deck 1 (Hog Cycle) – This is a classic Hog cycle, and can be adapted when mastered to feature Freeze or other combos too. Always use the Dart Goblin to start if possible – it is an amazing beginning Card for battles. Your main pushes should consist of HogLog, Hog + Ice Golem or Hog followed closely by a Bandit. Track your enemies cycle during your first push and send in Log slightly delayed behind to catch a SKArmy, Goblin Gang or other common deployments they make to counter your Hog Rider! Deck 2 (P.E.K.K.A. Poison) – Again a clever adaption of a meta style Deck, use the Miner mostly to deal damage with Poison and the P.E.K.K.A. for defense (it’s fast buffed deployment is incredible). You will want to use the Bandit as a defense or to support the P.E.K.K.A in larger pushes, in Double Elixir, to deal with Archers, Goblins and a range of other small glass cannon distractions; or, Bandit can be used with Miner as a chip push (watch your opponent’s cycle first – Bandit will be devastated if they drop a SKArmy). Deck 3 (Giant Cycle) – This Deck, as you may notice, is a tweaked version of the popular Surgical Goblin Giant cycle Deck. I’ve been using this myself and it’s amazing in all forms of play, so give it a go – the playstyle is basically the same! Cycle Minions, Skellies and potentially Bandit in defense, while continually Pumping to gain a huge Elixir advantage. Then you can keep cycling Giant pushes to pressure your enemy! Deck 4 (Mortar Siege/Control) – This is a fairly unique Mortar control Deck. Requires a lot of practice. Use the Tesla to defend the Mortar in large pushes or simply drop Bandit or Archers behind the Mortar for regular siege. Log any similar Cards your enemy drops, as SKArmy is very potent against Mortar in most Arenas. If your enemy is too powerful or uses a strong beatdown, play defense Mortar in the centre near your Towers to attract tanks (but the blind spot will force Mortar to attack support units! 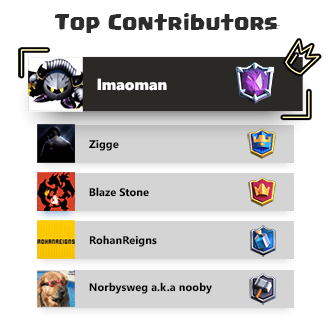 ), and support with Mini Pekka on the supports and Archers/Bandit on the tank! Then counter-push or simply cycle the Rocket to play a control-based siege cycle! Deck 5 (Golem Beatdown) – A typical Golem Deck adapted, this is a very interesting Deck that requires a mix of cycle and large beatdown attempts. Use Bandit to cycle quickly, and build up a large push while defend Hog or cycles with Cannon. Then support with Musketeer and E-Wiz! For Elite Barbarian counter-pushes or opposite lane rushes use E-Wiz and Cannon, or Mini Pekka, to try and deal with them – this is why Golem placement and timing is very important! Deck 6 (Miner Blitz/Burn) – A classic Bandit Miner cycle, this Deck takes several cycle archetypes and merges them together to form a very effective cycle blitz/burn Deck. Using the Miner and Bandit are both great chip units, and there are several other very powerful chip Cards included too. A great larger push involves setting Mini Pekka down, then drawing any distractions back behind the enemy Tower using a Miner lure. This can result in huge damage, and with Archers/Fireball as supports, or even Bandit, thousands of damage can be dealt. 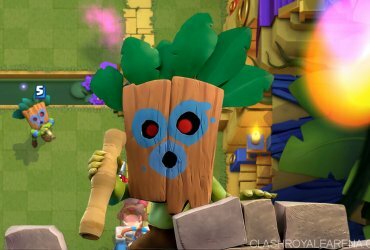 You will want to use the Bandit to lead attacks with Mortar/RG/potentially Hog Decks, but as a support unit with Giant, Golem and Lava Hound offense. This works best. Remember when defending, you must exploit your enemy’s placement by only dropping Bandit when they have deployed vulnerable troops such as Archers that can be easily ‘dashed’! Coming up against one of the most annoying meta Decks, RG Ebarbs, use a mini tank such as Knight or Ice Golem to drop ON their RG, and then drop Bandit far back and potentially an Ice Spirit or MM/Mini Pekka for heavy support against the RG! It is a cheap Card and therefore these substitute ideas work very well in most basic Deck archetypes. So, this is a topic we haven’t covered yet in the guide, but is very important in learning this Card. Bandit is a balanced unit and therefore opens itself up to some incredibly viable counters. Bandit can be countered by several cheap units. These include the Goblins, Skeletons, and Archers, if placed right. Because Bandit has a distraction mechanic and even when charging her course can be altered significantly, she does not pose a threat alone as a solo chip Card. However, in combos she may be more intimidating to deal with. When behind or in front of a tank, treat Bandit like the Musketeer – except imagine Muskie as a melee unit, with no range. This is why the Skeletons and Goblins are very effective – giving you an even or positive Elixir trade and the possibility for a cheap cycle counter-push, these are Cards that can exploit the Bandit’s lack of splash damage! You need to remember the Bandit’s weaknesses – she is not powerful at all as a solo unit, and if you have knowledge no matter what combo she is used in, sustaining a solid cycle where you can always have cheaper swarms ready will work to your advantage. 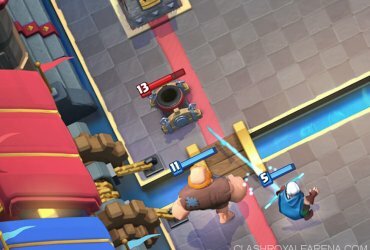 Your enemy, if experienced, is unlikely to Zap or Log, since Bandit is only a ‘small’ or minor Card and therefore does not have that much potential damage with low HP. I really hope you all enjoyed this guide – it’s been long, but as a strategist I’ve loved every part of writing it and hope you read and offer feedback on as much as possible! It’s taken a LONG LONG time! Enjoy, and please consider leaving some support below for my efforts! Clash on, and check out my channel for more!